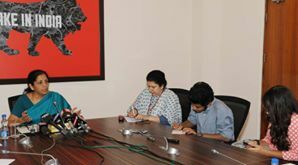 New Delhi: Commerce & Industry Minister Smt. Nirmala Sitharaman introduced the Footwear Design and Development Institute (FDDI) Bill, 2017 in the Lok Sabha on 14th March, 2017 to declare the FDDI as an Institution of National Importance (INI). The objective of the proposed legislation is to facilitate and promote teaching, training and research in all disciplines relating to design and development of Footwear and leather products and to enable FDDI to emerge as Centre of Excellence meeting international standards. The Footwear Design & Development Institute was established in 1986 with the objective of providing trained human resource and assistance to the sector. FDDI has pan-India presence with campuses at Noida, Kolkata, Chennai, Fursatganj (UP), Rohtak (Haryana), Chhindwara (M.P) and Jodhpur (Rajasthan) equipped with state of art academic facilities and infrastructure. New campuses at Hyderabad, Patna, Ankleshwar (Gujarat), Banur(Punjab) and Guna (M.P) would also start functioning shortly.